The vast majority of crafty blogs will feature a tutorial at some point, because you just can't beat the power of a good tutorial in attracting visitors. However, not all tutorials are created equally. (And certainly not all of them are terrific.) I've come across a few for otherwise awesome projects that were not well executed. If your idea for a tutorial is actually new and unique, it would be a bummer to have it not be understood by your audience. Actually, I can't stress this one enough: it's way easier to come up with a terrific tutorial if the subject matter itself is easy. So if you're intent on targeting the masses, choose something that's easy to do, like my 5 minute lip balm carrier. Or my 1 minute pin jar. Or my 5 minute ruler grips. I tried a variation of this idea with my origami ornament and in terms of blog traffic, it performed above and beyond my expectations. Think about it — what could be better than seeing your tutorial shared around the world by people who don't even speak your language? Another variation on this theme is a video tutorial that doesn't have narration; however, ensuring that a video tutorial is terrific involves a lot more work. If your tutorial includes written instructions, use simple, clear language and don't leave anything out. This means including measurements, quantities, and materials — preferably at the beginning — so that your audience doesn't have to guess. After you've written your instructions, test them. Ideally, you would do so by making a second test project, but if that's not feasible, make a "virtual" version. When testing your instructions, don't leave out anything and don't do anything that your instructions don't tell you to do. If you find yourself doing something that's not written down (within reason, of course; i.e., telling your readers to thread a needle before sewing is not a requirement), it's probably a hint that you haven't been thorough enough. You'd think that this would be a no-brainer, but I've seen tutorials that were just a list of instructions with a single picture of the finished project at the very end. I suppose there's room in the world for "instructions only" tutorials, but I'd venture to say that they're not quite terrific. The fact is, when it comes to photos, you should take one at every step of your process and when you think you have enough, you should add one more. Yes, it's a real time killer to stop and take photos when you're making something. But here's the thing — having lots of photos takes away some of the pressure of having to write detailed instructions or descriptions. Because a picture can be worth a thousand words. Want to convince your audience that you know what you're doing? Make your project look as professional as possible. Take pride in what you do. If you want your idea to be pinned, shared or liked, your chances of achieving that are greater if your work simply looks good. The bottom line is, if you're going to put out a tutorial showing how to make something, it should look nice! Put in the effort and you will reap the benefits. If your tutorial has been specifically inspired by something that you saw elsewhere or online, give credit. Hesitating because you don't want to be accused of taking ideas from someone else? If someone notices — and someone likely will — you might be accused of that no matter what credit you give. The crafting world being what it is, however, everything is derivative. (Think you're being unique? Think again.) I believe, however, that we all have the capacity to make something better by putting our individual touches on it. If that's the case and we want to share our creativity, it can be win-win, as long as we do our part and give credit for where our original inspiration came from. 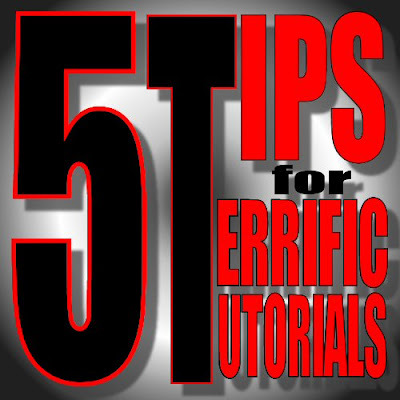 Good luck with your future (terrific) tutorials! 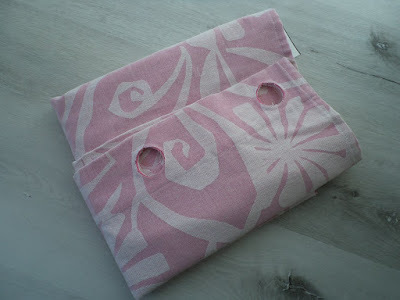 Guess what I made out of some Eclectic Elements fabric? Have you taken a (virtual) stroll through Bluprint's pattern marketplace lately? Ever since Craftsy — which it still was at the time — cleared out a whopping 93% of the patterns that used to be available on their website, people have been at odds over whether to continue supporting it or not. Some shop owners who were unexpectedly shuttered angrily vowed not to have anything to do with Craftsy/Bluprint anymore. Many of them put up shops on their own blogs and websites, thinking that was the solution. (It's not, not really.) Followers of some of these shop owners vowed not to support Craftsy/Bluprint, period, on anything. As someone whose shop was left standing (although decimated all the same), I haven't committed to turning my back on Bluprint just yet. If the past few months have proven anything, it's that Craftsy generated a heck of a lot more in sales than I could ever do on my own. At some point, I hope that Bluprint comes back with a mutually beneficial platform for pattern sales, because it's hard to match the levels of pre-qualified traffic that it used to bring us. In the meantime, you may be surprised by the caliber of the patterns that remain... if you can find them. I'm featuring one today. 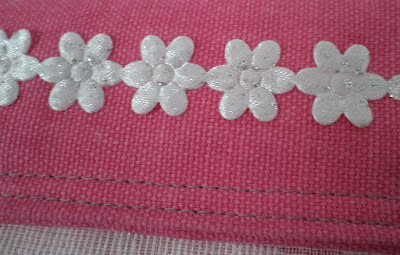 My version of Teresa Lucio Designs' Magic Pouch... isn't this fabric just "fab"? The Magic Pouch is a free pattern by Teresa Lucio Designs. 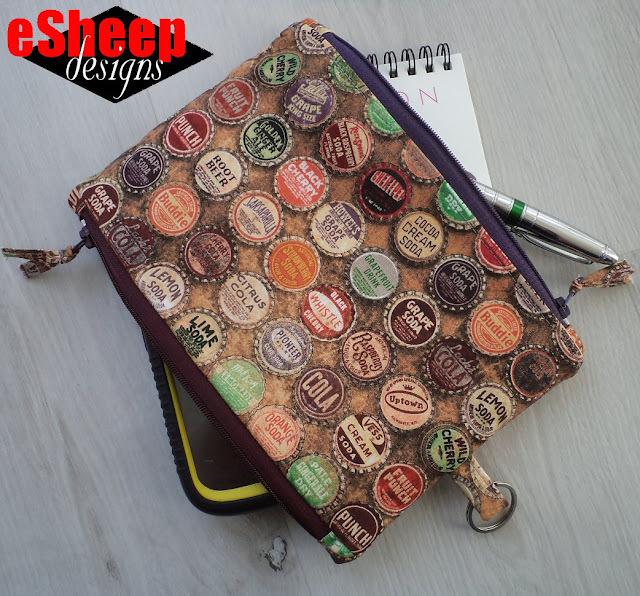 I saw it, thought it was unusual, and had the perfect Tim Holtz Eclectic Elements fabric for it. While I didn't know how it could be done by just seeing it, it ended up being obvious and simple to put together. Probably nothing to be scared about if you're a beginner. If you've done a couple of lined zippered pouches, this would be an ideal project to graduate to, so to speak. 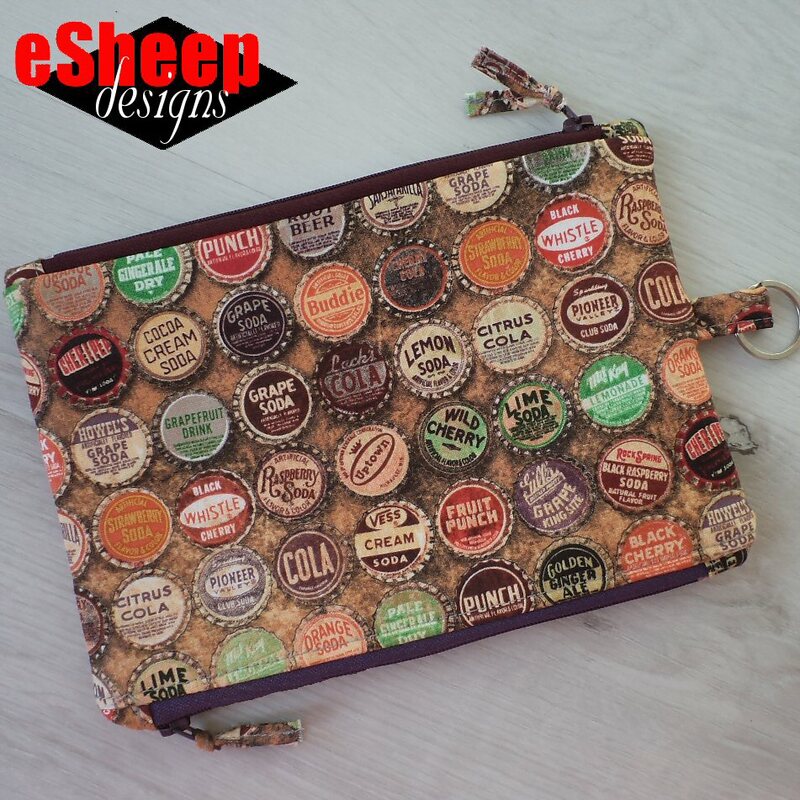 What would you use this pouch for? 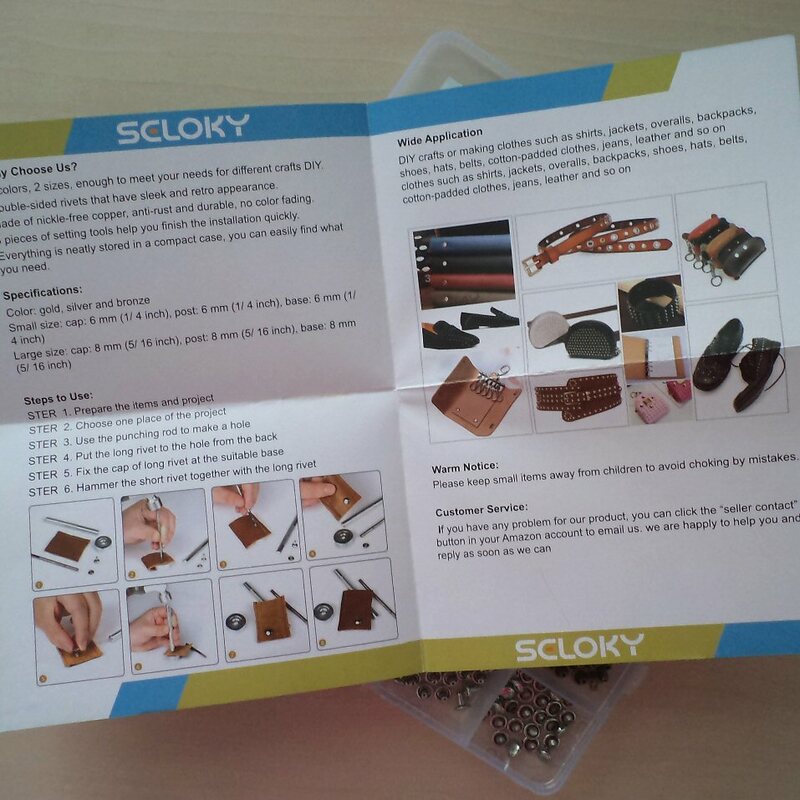 The instructions are passable, with self-explanatory photos making up for any confusion. Again, if you've made a basic lined zippered pouch before, you should be able to find your way around this project. The pattern calls for virtually every piece to be interfaced; indeed, there's even a separate template for the interfacing, which is convenient. Apart from the two exterior pieces (onto which I interfaced some fusible fleece), however, I didn't bother interfacing any of the lining pieces, or the zipper tabs. It looks and functions fine without the extra time — not to mention the expense — put towards SF101 interfacing. 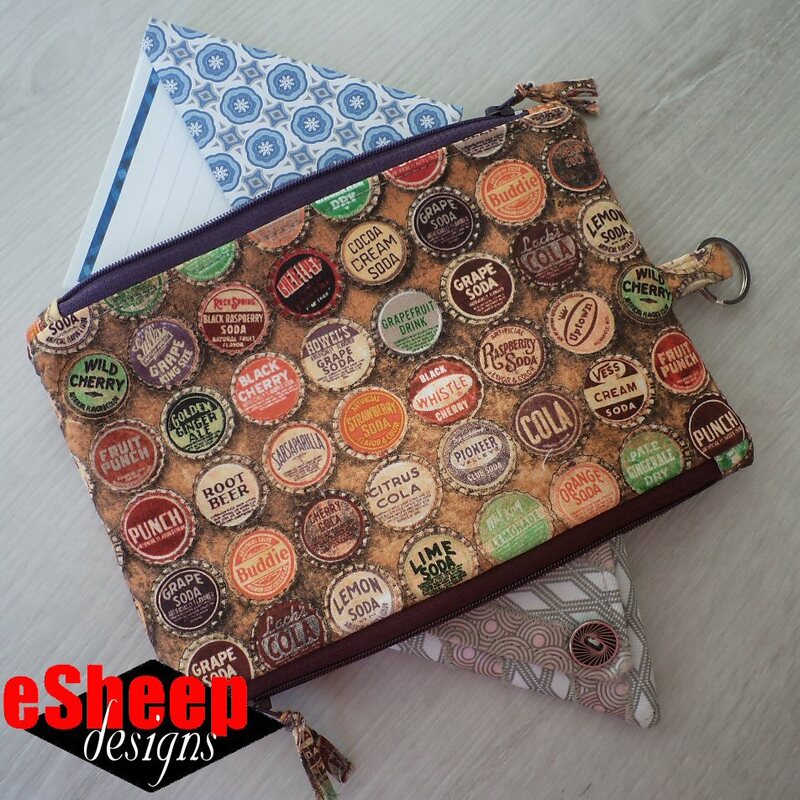 The pouch finishes out at 8" x 5.5" or 20cm x 14cm, a useful size that's not too big and not too small. 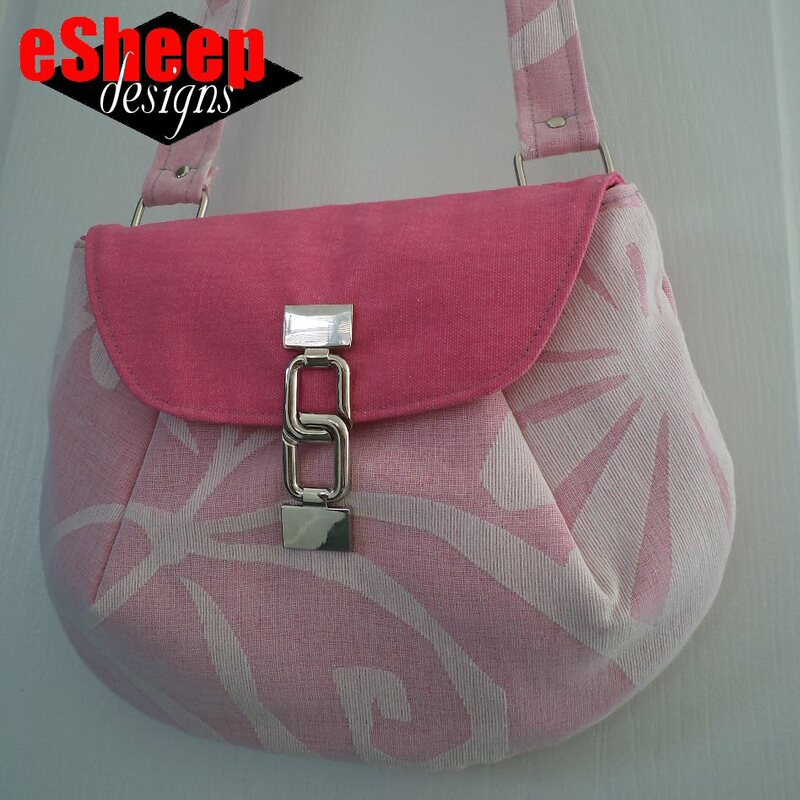 It's designed as a wristlet with a carrying strap, but since I don't use wristlets, I didn't bother making the strap. My intended use for this pouch will be as secure storage for important stuff inside my big beach tote, where it will hang from one of my many lanyards, like this one for a hotel key card. Interestingly, one of the instructions was to ensure that the zippers pulled in the same direction. That was funny, considering that I specifically wanted my zippers to pull in opposite directions. Maybe you should just pay attention when you install your zippers that they run in the direction that you prefer. I also used two different coloured zippers to tell which pocket was which. I will appreciate having that distinction when I eventually use it. 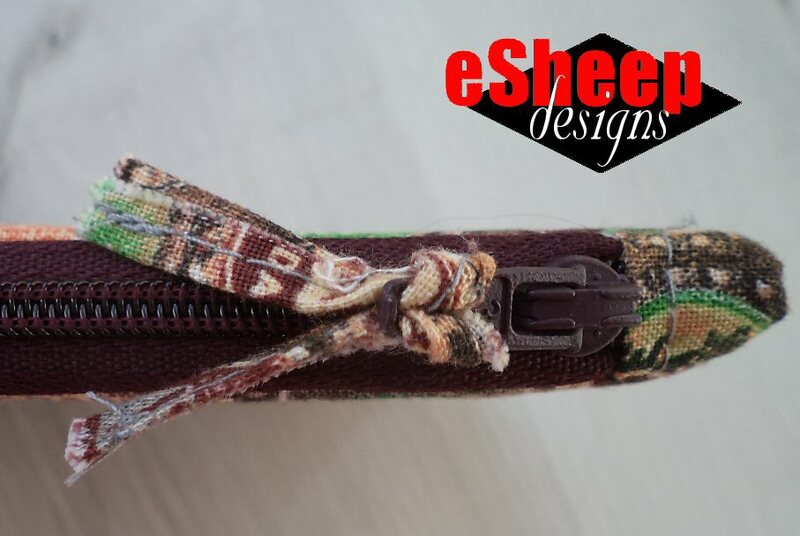 In the photo of the finished pouch that accompanies the PDF pattern, it shows some leather zipper pulls. 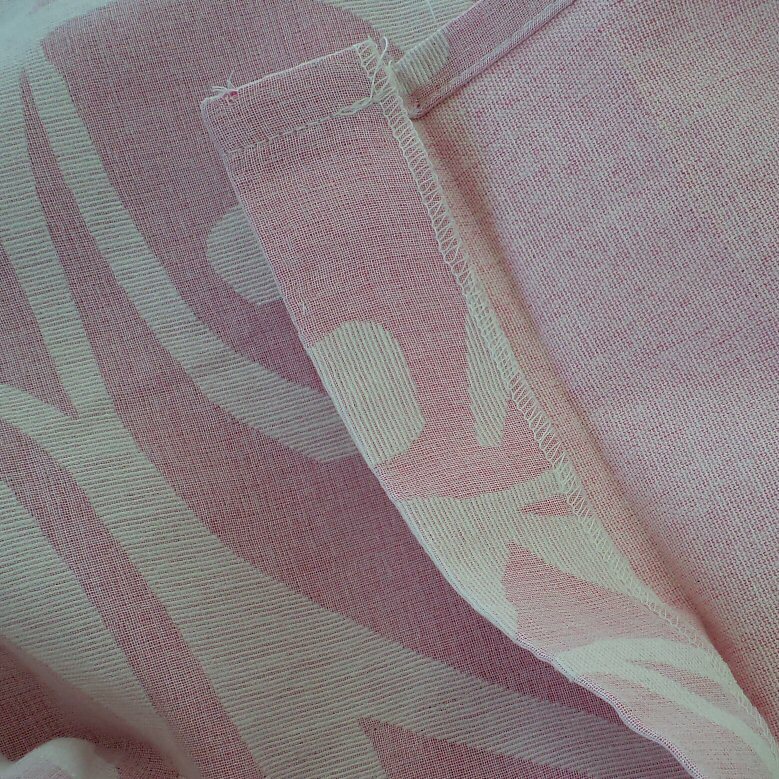 I sewed up small strips of my exterior fabric and used them in the same way. 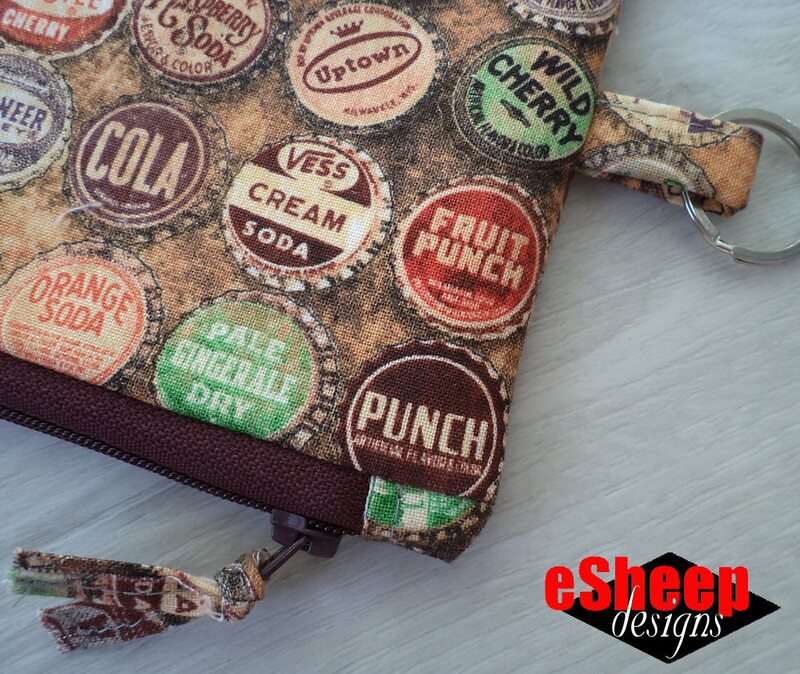 If you like zippered pouches — or even if you usually don't — the Magic Pouch is a worthwhile project to tackle. It should take you no more than a couple of hours and the result is certainly a step up from the ordinary. You can get the pattern from the designer's Bluprint shop here. A couple of weeks ago, spring had not yet technically arrived, but our deep freeze of a winter finally looked like it might be over. 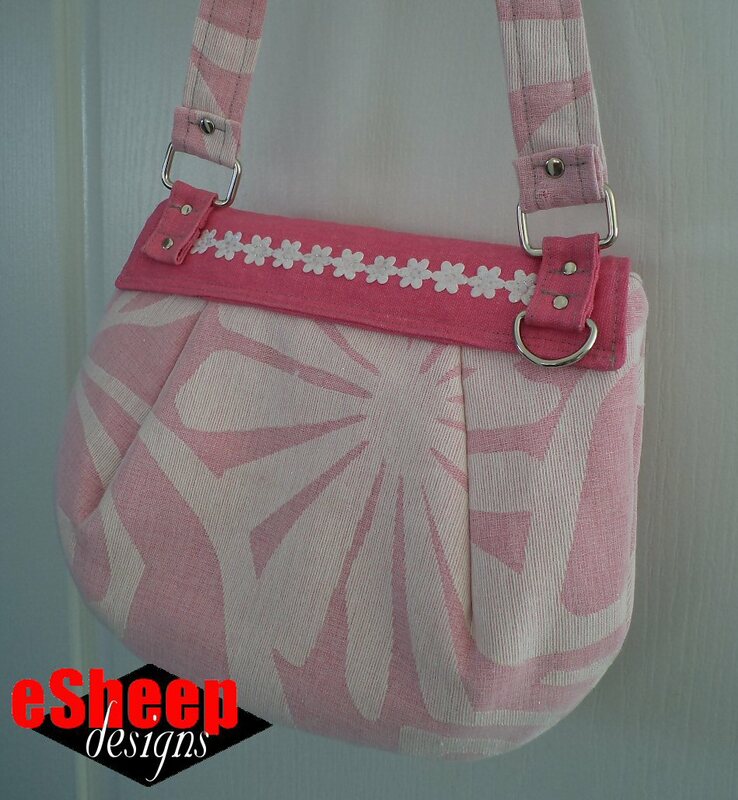 With the bleary-eyed switch to daylight savings time came a desire to do something to celebrate spring, which led to this bag. Yes, I'm surprised as well. Having not made any bags for quite some time and having had no interest in doing so, I've now made two in the span of three months. What is wrong with me?? 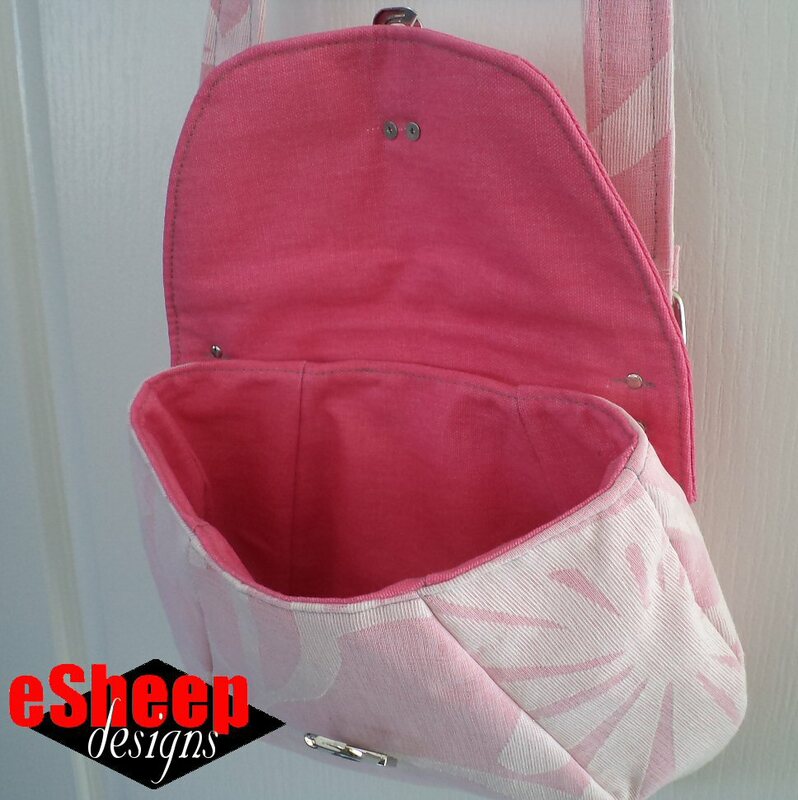 This is a 2018 freebie from Sew Sweetness: the Oriole Bag. I found it saved in my Other People's Projects folder. (I'm sure you're familiar with Sara Lawson's work and can google it if you're interested.) 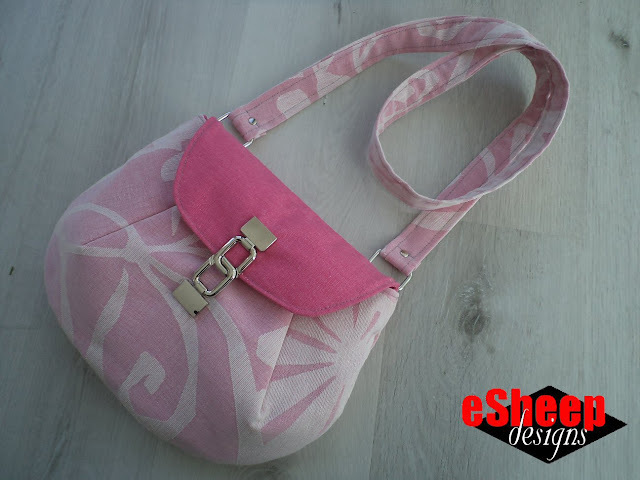 The pattern is offered as both a PDF and a video tutorial via YouTube and is available in two sizes. 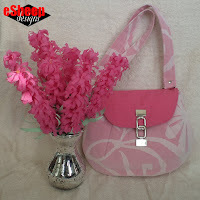 The one you see here is the smaller one, which in my opinion is as big as you might want to get for crossbody use. Although it's gusset free, it has a defined three dimensional shape, courtesy of a couple of darts on each side. I've been mulling over an idea for a bag of my own using darts and thought this would be an ideal way to get a feel for how they'd turn out. I even have matching sunglasses! You might be curious about the title of this post. I dug into my "non traditional" pile of fabric to do some spring cleaning — i.e., to see what could I use up — and saw this. I picked up this curtain panel at Value Village almost two years ago, harvesting ten plastic grommets from it. Interestingly enough, I haven't yet used those grommets. When I removed them, however, I was surprised to discover that the fabric was double layered: it's a deep pink cotton duck covered by a sheer patterned overlay of white polyester. Therefore, the two different fabrics that you see are from the same source. But the versatility of the fabric wasn't the only bonus. And since I didn't need to make the strap adjustable, what I harvested off the curtain ended up being just the right length for me. How absolutely serendipitous! Recall my $1 belts from last summer? One of them had this buckle that has now been up/recycled into this cool purse flap closure. The two rectangular rings were also recovered from something, but I don't know what anymore. The D ring was a trim from an old pair of boots. This is new: floral ribbon glued across the back of the bag. 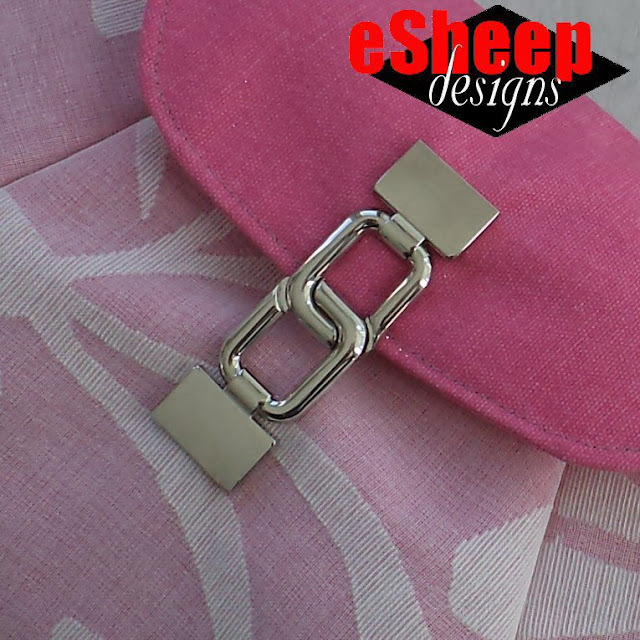 I like to add visual interest to both sides of a bag, and this bit of ribbon does the trick. Many thanks to Sara for generously creating several freebie bag patterns for the sewing community to enjoy over the years. This is the first that I've attempted and probably one of her simpler styles. I added the rivets after doing the initial sewing. (I then decided to leave the stitching underneath as further reinforcement.) I used four of the small rivets and two of the large ones from the kit that I posted about last week. View of the bright interior! When I cut the material for the flap, I left the overlay on. Until the last minute, I really didn't know whether I'd keep it or just use the bottom fabric by itself. Either way would have been fine, but I have a fondness for this rose colour, which is probably the most accurate name for this shade of deep pink. Check out this side view to see how flat pieces can be transformed into three dimensional entities. 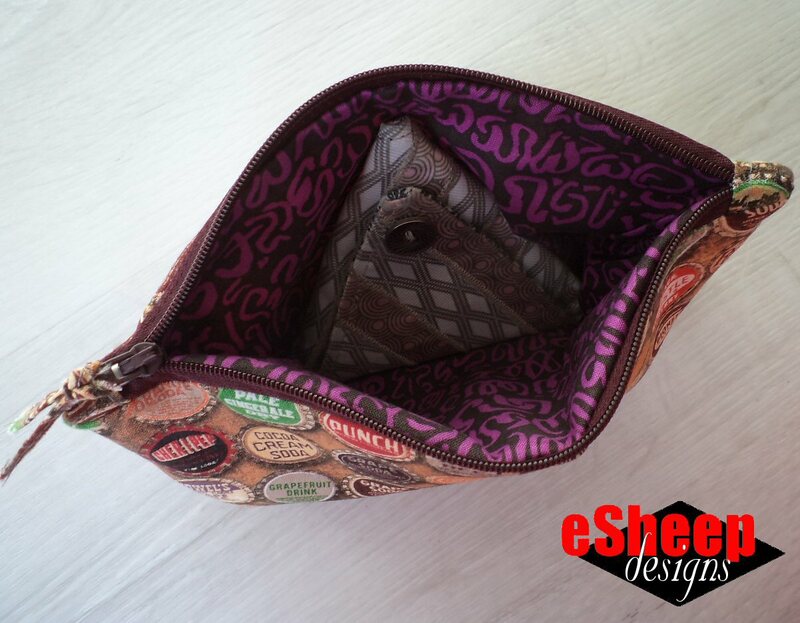 The darts create room inside this bag without the need for a gusset. Again, I used fusible fleece to interface my exterior fabric, which gives it a softer finish. If you go with the foam option, the bag will likely hold its shape even when empty. Further on the matter of interfacing, since the cotton duck is already substantial by itself, I didn't add interfacing to any of the other pieces. Remember I said earlier that I had a plan to organize the contents of this bag beyond pockets? It's with this matching pouch. 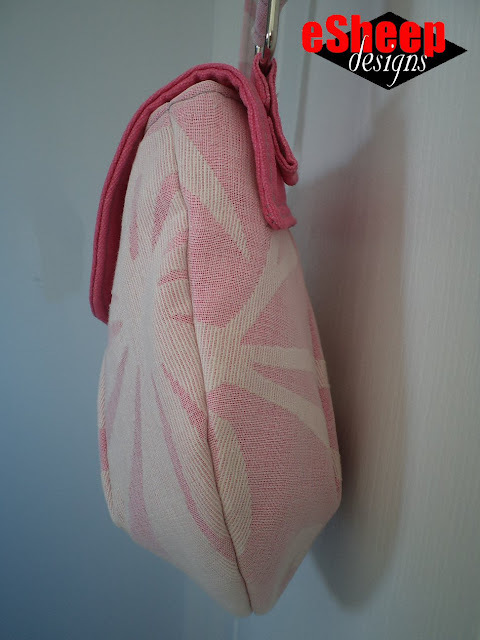 I don't have a pattern or tutorial for the pouch to share with you. (If you need to see something similar, check out my mini retro reticule.) 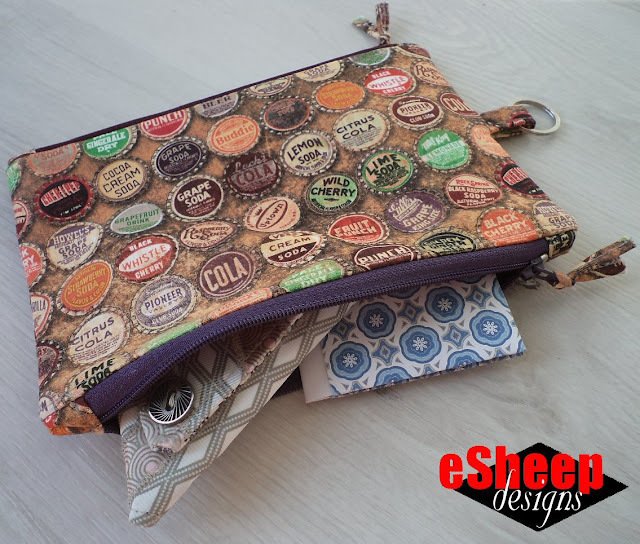 It's just four panels of fabric sewn up to a zipper with tabs at both ends; i.e., your basic lined zippered pouch. 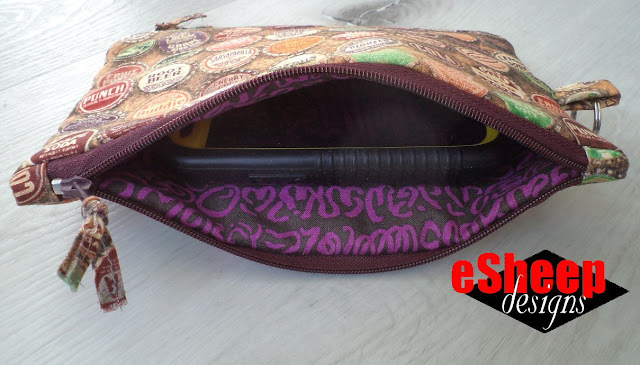 In hindsight, I should have cut the top part of the pouch so that it tapers inwards a bit, but this was one of those "be creative on the fly" projects that wasn't thought about in great detail before it was done. When I look at this purse, I'm propelled back in time to my university years. 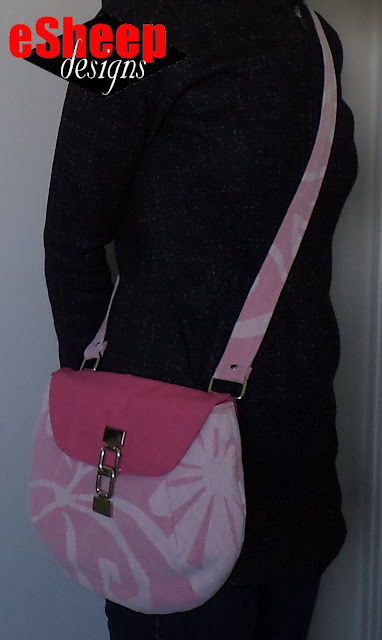 Lilac — the colour — was all the rage one spring, and I had a complete outfit in various shades, topped off by a canteen style crossbody bag... also in lilac. I have a clear memory of that warm "spring has finally sprung" day when I headed off to class in my light purple ensemble. 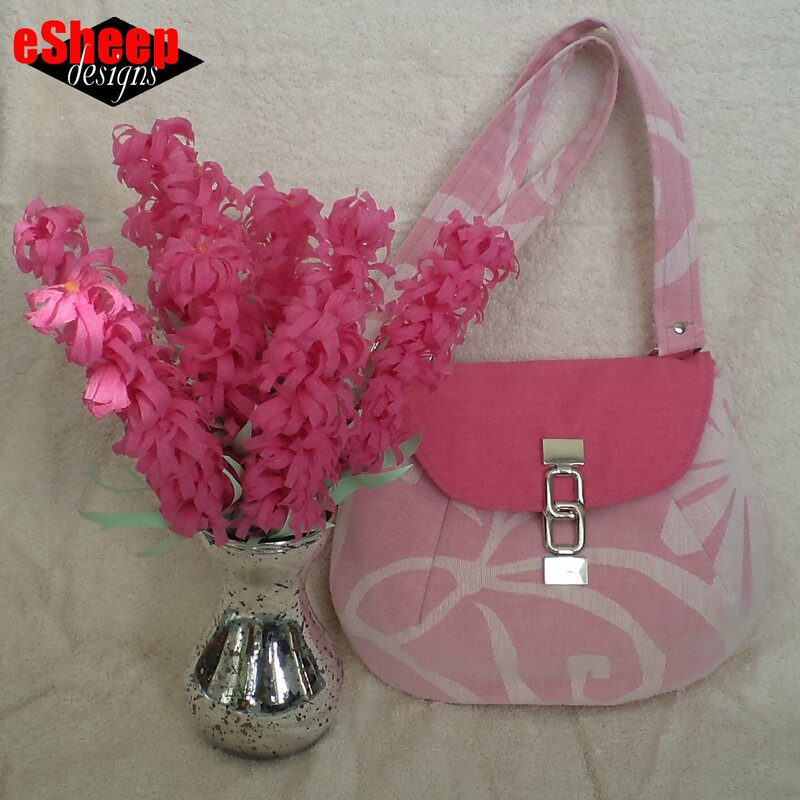 I'm no longer drawn to lilac, but this pink/rose bag carries a similar spring time vibe for me. 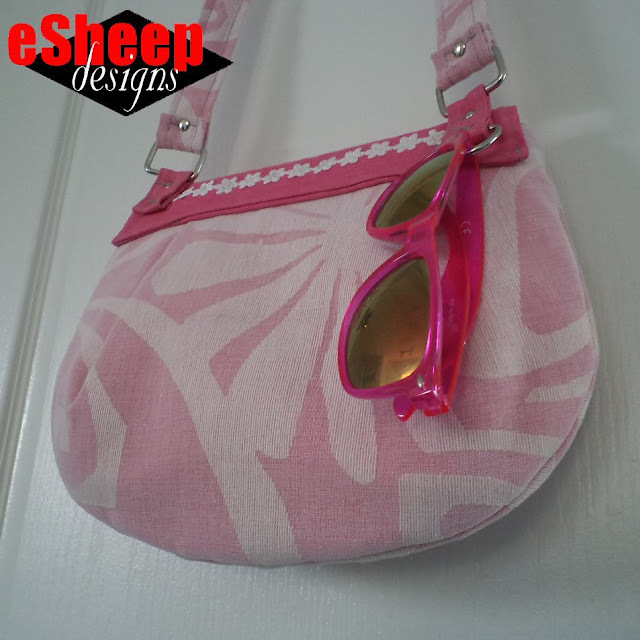 It's not ever going to be an everyday purse, but it's cheery and fun and assures me that the dreariest days of winter are behind us. Everyone should make a spring time bag... even if you don't channel Scarlett O'Hara to do it! I've been wanting to buy a rivet set for quite some time, but got terribly confused when I visited our local Princess Auto (last mentioned when I sewed up a winch cover for my other half) and saw what they had in stock. They looked nothing like what I expected rivets to look like. 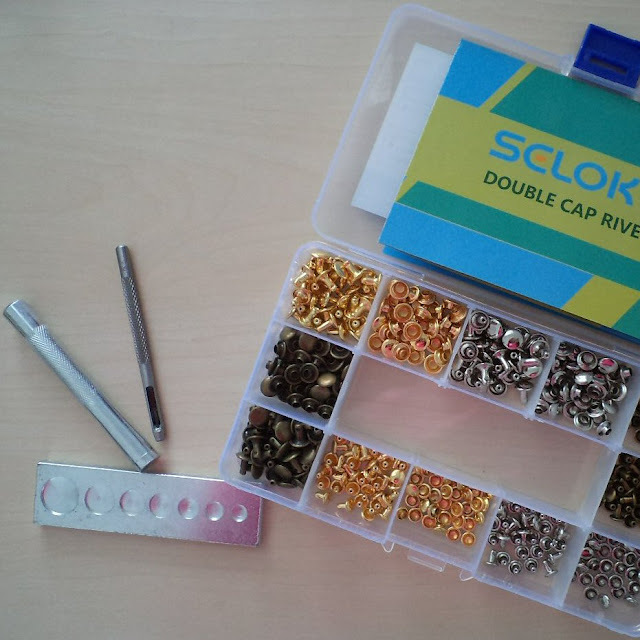 Without going into a long story with boring details, let's just say that not all rivets are the same and if you want them for crafting — and bag making in particular — you probably want double cap rivets. After some browsing on Amazon, I finally got myself a complete kit for a decent price ($12.90 USD; $18.99 CDN). This one is made by Seloky. 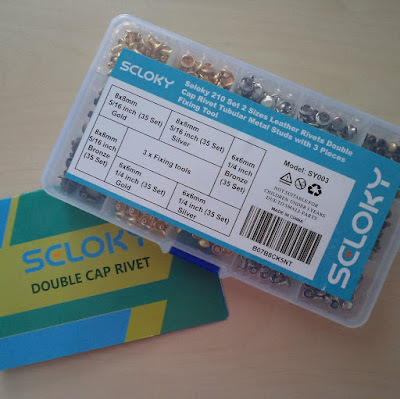 It includes 210 double cap rivet sets (420 individual pieces) in two sizes: 5/16" and 1/4" (8mm and 6mm), 35 each in gold, silver and bronze tone. While less expensive sets are available, the deciding factor for me was one of the setting tools. It had the standard punch and set tools, but the setting base was what sold it. 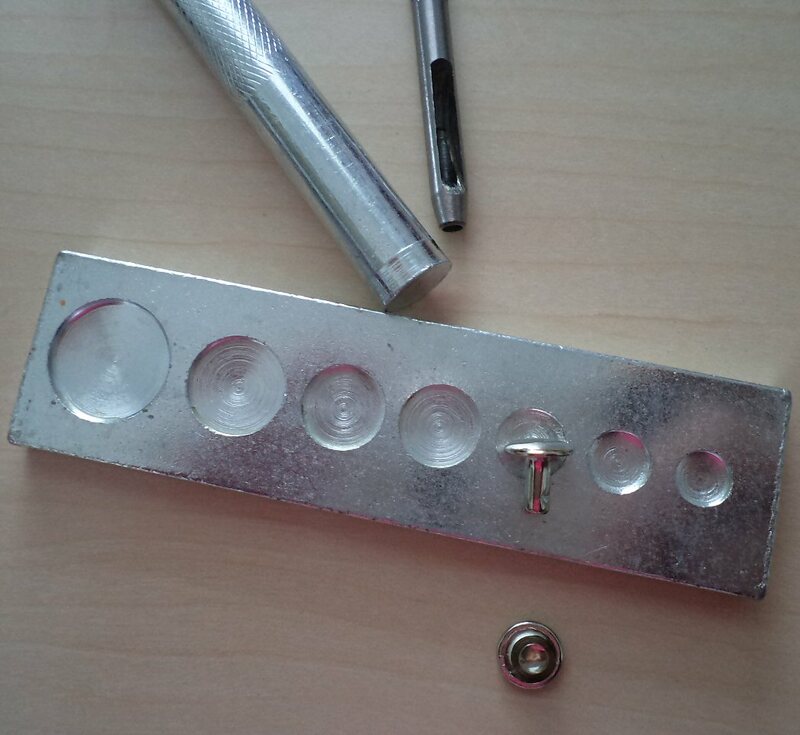 After the hole is cut, slip the rivet stud through. Position the rivet stud on top of the base piece — stud facing up — and place a rivet cap on top. Now the setting tool — which has a concave end to cover the rivet cap and a flat end that you pound on with the hammer — can be used to secure the rivet cap onto the rivet stud. Comes with instructions... although the English is questionable! It's that easy. No more complicated, really, than installing snaps or grommets. It didn't take long to come up with the belt idea. I had kept the buckle/fastener from a belt that had been repurposed into the waistband of a skirt a while back; naturally, it was meant to be put back to use on another belt. It's a simple project. The two pieces of fabric were joined end to end and then the long edges were sewn together and the whole thing turned right side out. The width of the belt was purposely wider than the "buckle" to create a pleated look, but the thickness and stretchiness of the lycra did not make me feel confident about actually sewing those two end seams around the hardware. So the project sat for over two years. I would occasionally look at it and wonder, should I attempt to sew this today? 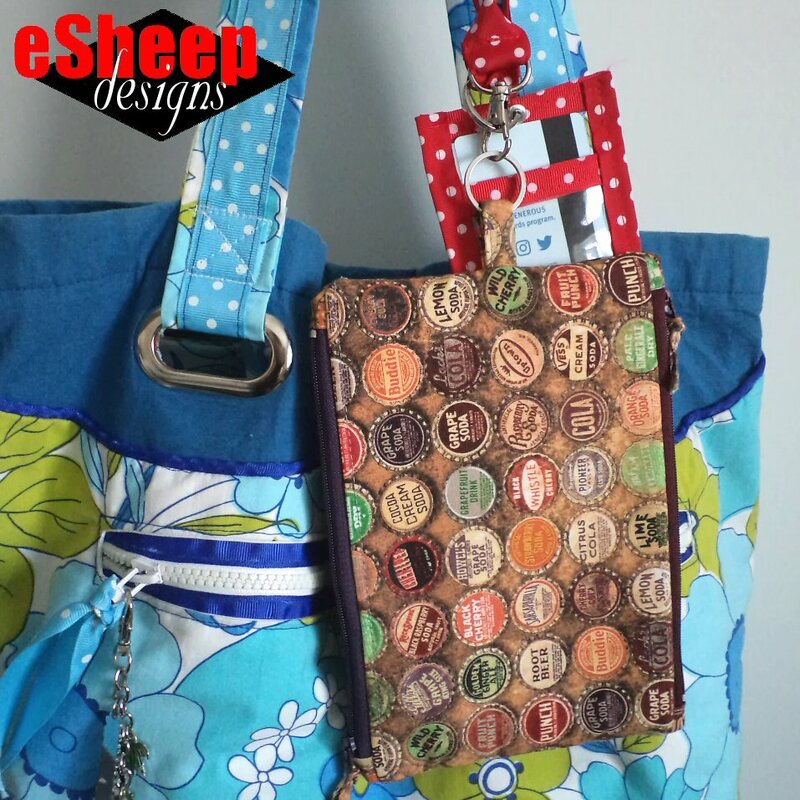 A solution that is so much easier than sewing! I don't remember at what point I decided that rivets would be the solution, but I know that I've been looking into getting some rivets for almost a year. The end result is that — using six sets of the smallest rivets — finishing it this way probably took me less time than it would have taken to sew it. Not to mention that it probably looks a lot better, too! One last word about rivets if you're thinking of making your first purchase. The length of the stud post is important to consider for your intended application. While my layers of lycra would have been thick to sew, comparatively speaking, they aren't as thick as a couple of leather purse straps. What I mean is that if you're buying rivets for bag making purposes, ensure that you have stud posts that are long enough for the job... but not too long. Generally speaking, the bigger the cap diameter, the longer the post. The rivets in my kit have the same cap diameter as post length: the smaller ones are 1/4" or 6mm; the larger ones are 5/16" or 8mm. Given that I work with fabric — and not faux leather or cork — I think they will serve me well.